prognoses continue to improve, the population of survivors at MSK is growing creating a need for further research into survivorship. 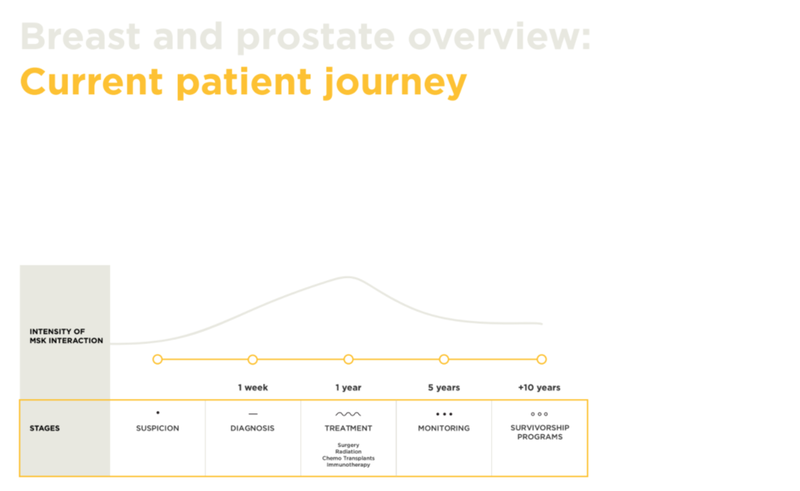 Given the nature of cancer, even after the patient has finished active treatment there is an extended monitoring period that can keep the patient connected to MSK for years. 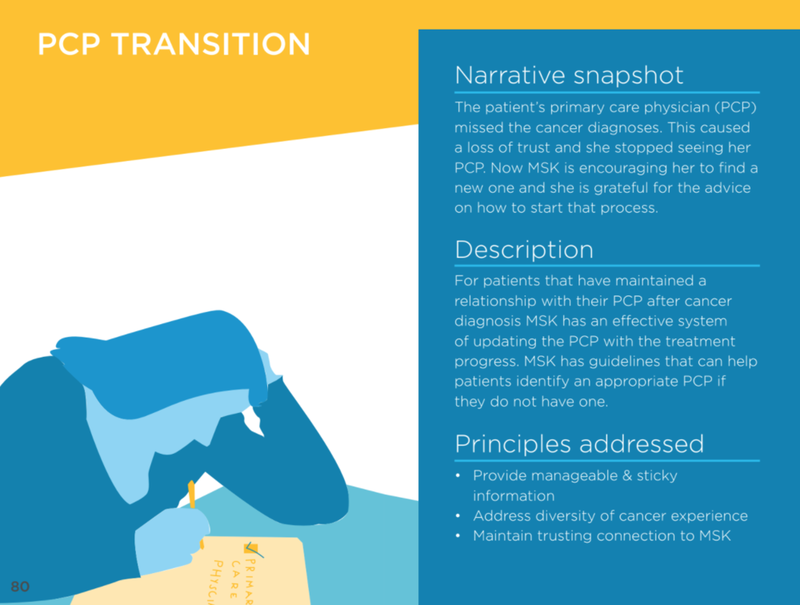 During periodic monitoring, the patient requires significant support to ensure an emotionally satisfying transition to survivorship, and out of MSK care. 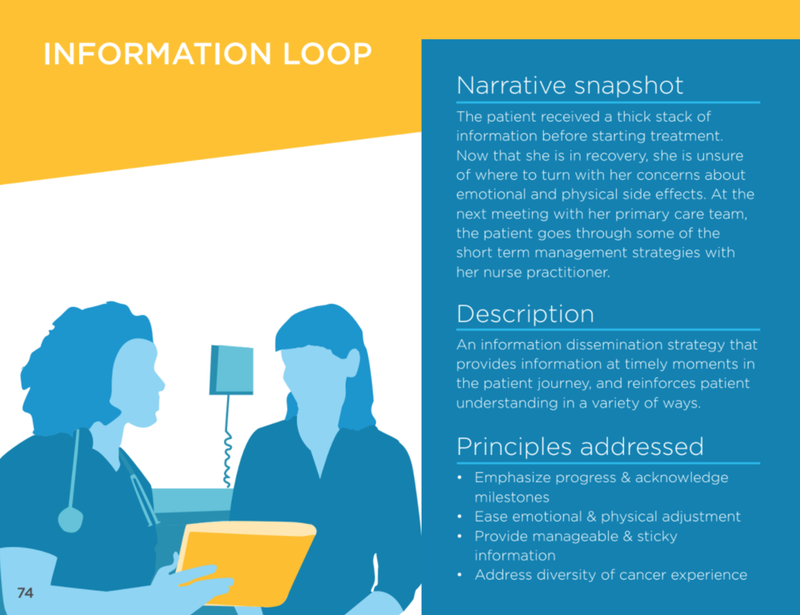 LEARNING: Understanding the entire patient journey is important because the survivorship experience is linked to the patient's broader cancer experience. Breast and Prostate patients are the most common cancer types treated at MSK, collectively making up about 25% of the patients seen. 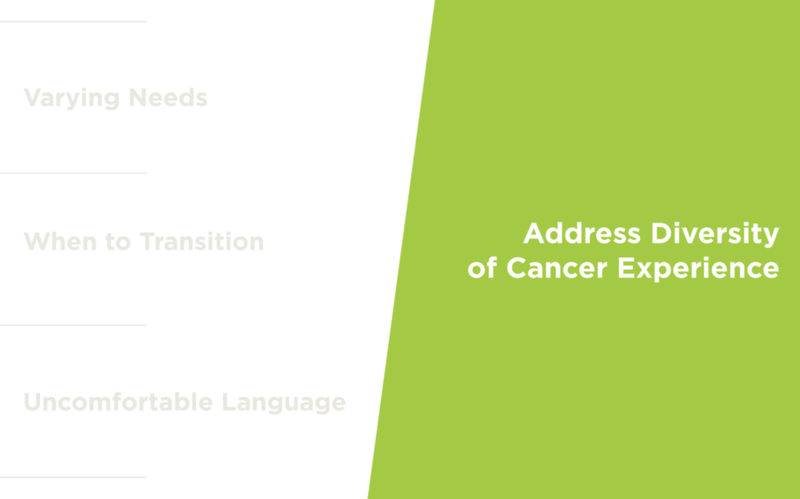 Often the treatment for these cancer types is relatively straightforward. Interaction with MSK escalates after diagnosis, peaks during treatment and then gradually declines as the patient enters the monitoring phase. Ideally their interaction with the institution continues to decline as they transition to a survivorship clinic. Finally, they return to their PCP for all routine care and basic monitoring. Conducted research into patients’ experience of ringing a bell to celebrate the end of radiation therapy. This fed into our broader research into rituals and symbolic acknowledgments for patient transitions. Radiation Oncology team at MSKCC have been exploring the possibility of installing a bell to be rang by patients at the end of treatment. 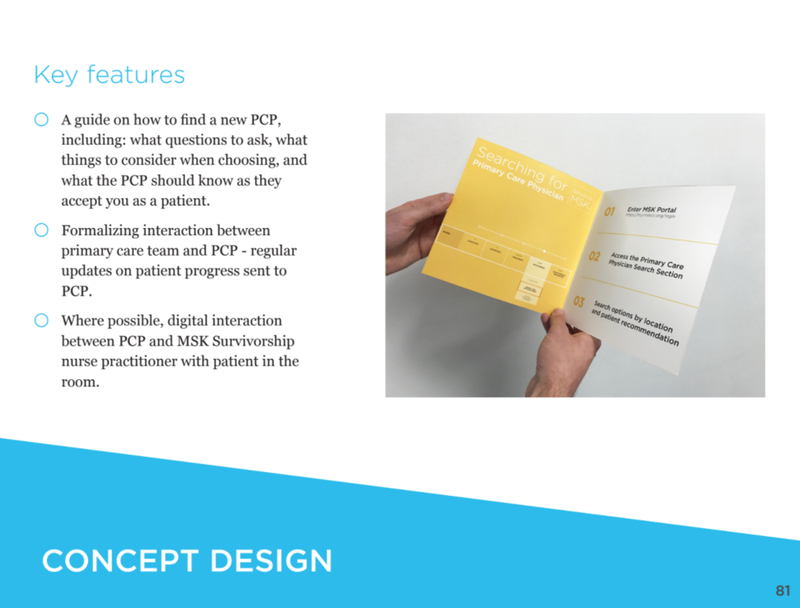 Strategy and Innovation were asked to conduct research and install a prototype to gauge patient, staff, and caregiver interest in a bell. The outcome of the research was intended to help Radiation Oncology and Operations to decide whether to implement the bell long term. The research was guided by initial hypotheses from Radiation Oncology and Operations on the potential benefits and risks associated with implementing the bell. To understand the idea of rituals and symbolic acknowledgement during the patients' experience, we first conducted some interviews with patients at the Radiation Oncology department. interested in collecting survivor data to better understand how cancer behaves. protocols, lifestyle, and demographics can affect outcomes including recurrence, and other side effects. In order to do this MSK proposes developing digital solutions that will support the needs of survivors, and keep them connected to the institution so that researchers can leverage the large pool of potential respondents. Built two digital interaction platforms in the form of mobile apps that survivors can use and is responsive to their needs of survivorship. 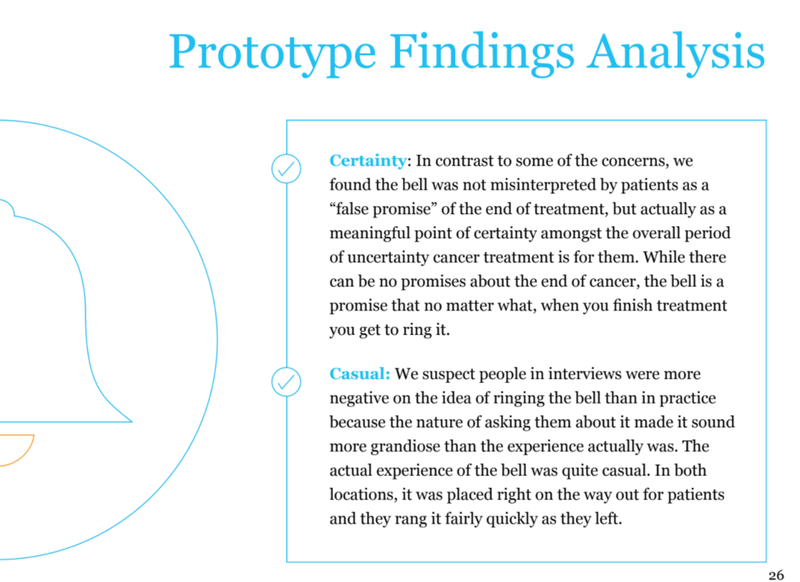 Prototypes of both apps were tested with survivors in the waiting room at the Breast Cancer Survivorship clinic. We spoke to 4 breast cancer survivors. All were over the age of 60, and all were more than 5 years out from active treatment. None of them currently interacted with the MSK portal or any digital offering. Similar to our prior interviews with survivors, we found that all of the survivors we tested with expressed enthusiasm in contributing data to research. This included filling out surveys. They did make sure to note that their participation in survey based research would depend on the length and frequency of surveys. This in turn helps to solve for the needs of survivors, as survivors are only growing. 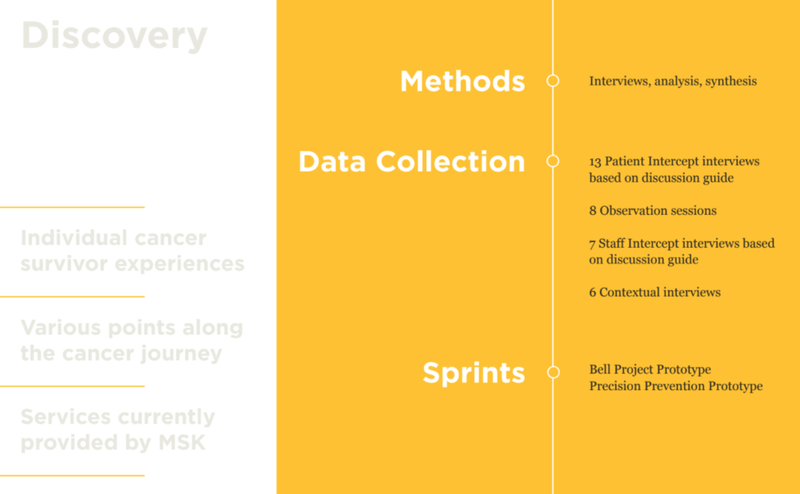 Created 6 guiding principles based on research and quick prototyping with patients and MSK staff. These principles are intended to serve as the foundation for any initiatives aimed at the survivor population. Based on guiding principles analysis and synthesis, 9 design concepts. 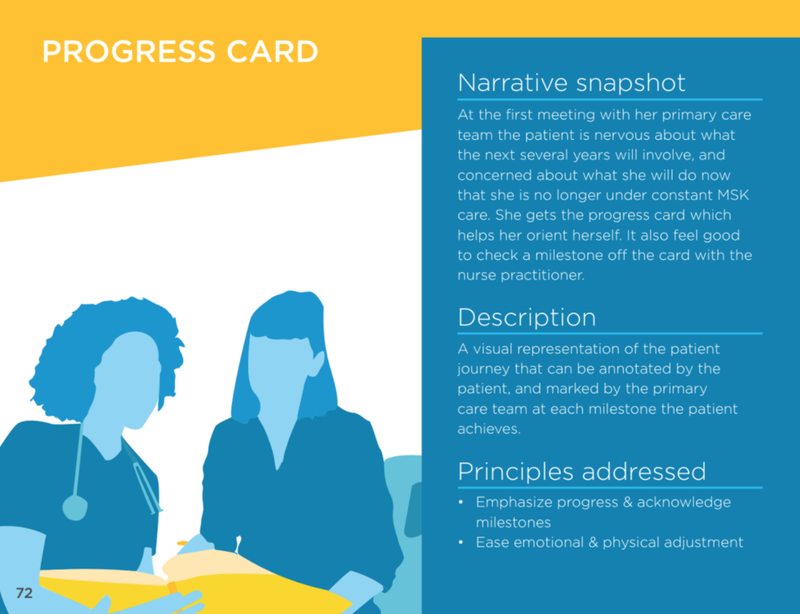 These proposed interventions cut across the patient journey as we acknowledge that improving the survivor experience requires a holistic approach. 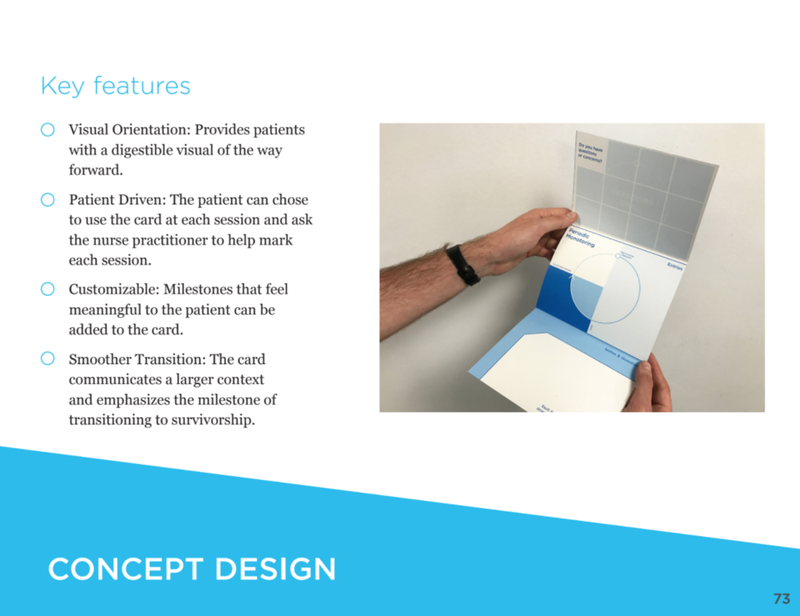 The design concepts are placed on the timeline below to show an approximate starting point when they could be inserted in the patient’s journey. 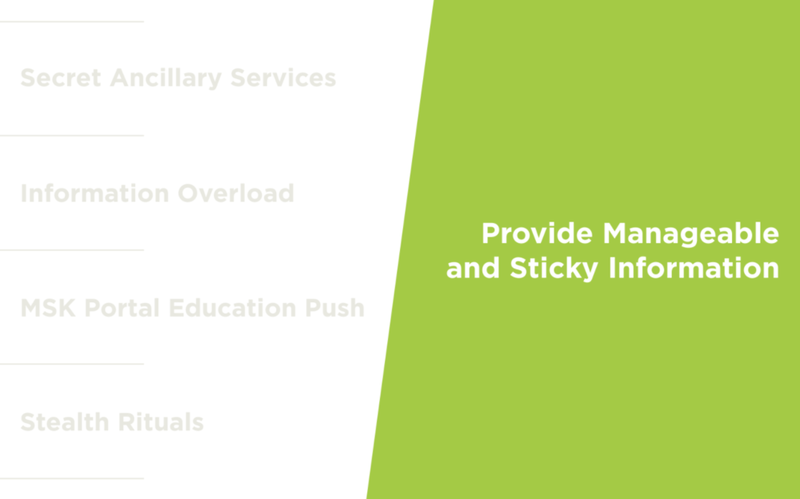 Better information, leading to confidence of tracking progress and milestones.